It is the time for entertaining which means the need for easy and tasty appetizers. There is a local restaurant that is famous for its delicious dipping sauce for bread. It is a twist on bruschetta, with tomato and balsamic vinegar being the primary flavors. I’ve been trying to recreate it, and recently had the best success yet. I tried it out on my book club, most of whom have had the original, and they were very pleased with the results. Because this is the type of dish that gets better as it sits, it is great to make ahead – even by a couple of days. Peal & chop tomatoes, lightly salt, and place them in a colander to drain the liquid. Reduce the vinegar over medium heat by half. Add sugar, garlic and onion and cook another 5-10 minutes, making sure sugar dissolves. Remove from heat. 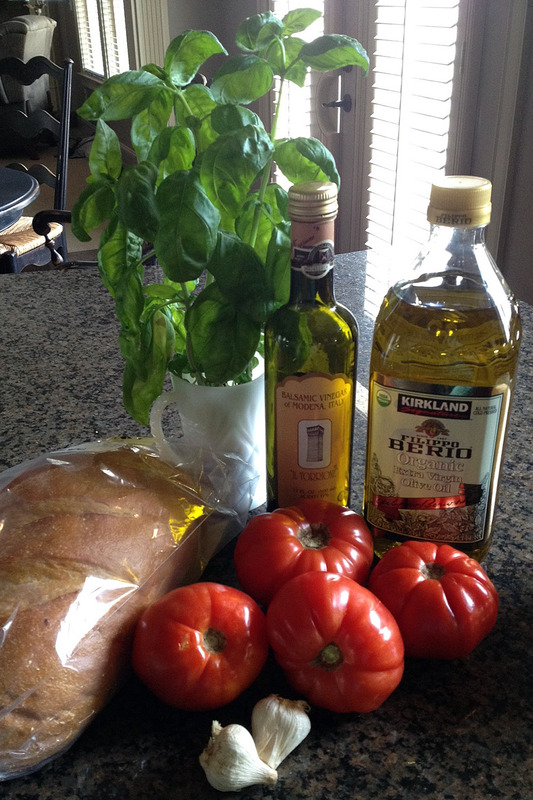 Mix in tomatoes, basil and olive oil. Update: Hey, readers! This is one my most viewed posts! So, if you end up making this recipe, come back & let me know what you thought. Also, if you tweaked it, add that to the comments as well. Thanks!